I hardly know what to expect anymore when I see “Eau” next to a perfume's name. Sometimes an Eau is simply an Eau de Toilette version of another fragrance, and it may be almost as assertive as its parent fragrance but more citrusy (think Cartier Le Baiser Eau de Toilette). But sometimes an Eau is a different fragrance altogether from its brand's namesake fragrance (L’Eau de Chloé). Elie Saab Le Parfum L'Eau Couture, flanker to 2011's Elie Saab Le Parfum, is a greener, lighter version of the original — a definite relative, but a different fragrance and much sheerer. Fans of Elie Saab Le Parfum should give it a try. I wouldn’t be surprised if some people like it better than the original. L'Eau Couture was developed by perfumer Francis Kurkdjian, who created the original Elie Saab Le Parfum. L'Eau Couture's notes include bergamot, magnolia, orange blossom, green almond and vanilla. I also smell a hint of the woody musk that has been filling in the past few years where oakmoss might have once have played a role. L’Eau Couture kicks off green and floral, and its orange blossom steps right up. Don’t dismiss it as another fresh orange blossom, though. L’Eau Couture’s green edge combined with wetter, more supple floral notes, bring the fragrance into a summer garden, giving it grace and wiping away any hint of gas station lavatory soap. A wisp of powder settles over the scent, and a musky-woody note grounds it and adds the touch of ugliness that seals its beauty. Vanilla weaves through L’Eau Couture as a slight but present thread. L’Eau Couture runs through its paces quickly and fades into a faint wood, musk, and a curiously cinnamon-like jasmine-orange blossom tingle. It isn’t as evanescent (or cool) as, say, Hermès Jour d’Hermès, but if you find you like L’Eau Couture, you’ll probably want to buy the largest bottle and spray with abandon. Tuck an atomizer of it into your purse for later. The original, Elie Saab Le Parfum, is a diva who trots orange blossom to La Scala and demands center stage, all while playing the virgin. L’Eau Couture is more quiet and fresh, but still pretty and just the tiniest bit challenging. It’s a real perfume, not just something that smells like it was ginned up to make quick sales to 20-somethings on payday. To me, L’Eau Couture smells a bit too mature for teenagers, but anyone older — up to and including your mother and grandmother — who wants a light, classic fragrance, and who doesn’t feel like she has to trumpet her sexuality in patchouli and purple fruit, will find room for it in her fragrance wardrobe and may even fall in love with it. L’Eau Couture’s lovely yet conservative aura also makes it a safe bet as a gift for anyone who is used to perfume at all. For that reason, I think it will be popular, and I think it deserves it. (The same WWD article I mentioned above reported that L’Eau Couture is expected to gross $25 million its first year.) Will I rush out to buy a bottle at retail prices? No. But I’d definitely recommend sampling it to people who aren’t obsessed with perfume but who want a subtle, easy, but real perfume for every day. And if I find a cut-rate bottle somewhere, all bets are off. 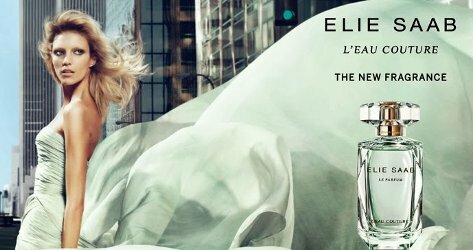 Elie Saab Le Parfum L'Eau Couture Eau de Toilette is available in 30 ml, 50 ml ($73) and 90 ml ($97) bottles and can be found at higher end department stores. A boxed Mother’s Day set at select stores this season gives you two free 2.5 oz “shimmering” body lotions when you buy the 90 ml Eau de Toilette. 1. WWD, January 2, 2014. Ah, thanks so much for this Angela–I had completely lost track of this one amid the other recent pale green releases! Actually for that matter can I ask–if you’ve tried them, how did you feel like it compared to Dolce or the Carven EDT? It sounds like the Elie Saab is more interesting than either? I’m woefully behind on my new releases and haven’t smelled either of those yet. Maybe someone else can respond, though. Sounds nice… will definitely grab a sniff when I can (for me, that means purchasing a sample since I don’t live near a store where I can smell it at the counter). I liked the original very much and did not find it particularly diva-esque, but that insistently clean, persistent patchouli just Did Me In. This has less of that screechy quality? Email me, I’ll send you one of mine! catherineh789 is the handle, on gmail. Meanwhile, me too, wearing the original just wears me out. I actually haven’t tested my samples yet after a mere blotter sprayed with the Parfum Intense last week gassed my purse for days! Not that smelled bad–which is why the blotter went in my purse–but after more than a couple hours, I was just completely done in by it. You win, Elie Saab Parfum Intense, you win. The original took center stage for sure! I have a decant but don’t find that I wear it much. Still, I really do admire it. I didn’t find it particularly screechy, and it didn’t hit the persistent high note that the original did–at least, not for me! I will have to seek a sample. I do like the original but it’s a bit on the sweet side. Haven’t tried the intense version, it sounded even more sweet, I don’t wanna hang with it. I haven’t tried the Intense version either–again, I am so far behind on new releases! I love the original, the EDP, especially for its juicy honey. I don’t find it either screechy or diva-esque, but it’s a statement fragrance for sure. I have to be in the right mood to wear it. The Intense for me had quite a strong beeswax note I did not care for, and it had lost the lovely airiness of the original. The EDT I’ve only ever tried briefly. I liked it and especially its bright citrusy opening, but did not give it much of a chance because soon after that I saw the EDP going for a very good price, so I grabbed it. I found the Couture disappointing. Maybe it was the woody musk, but as it dried down I found Couture became dull, and then borderline annoying. I was glad when it left. Woody musk is always a danger sign for me, too, but I thought it was relatively quiet in this one. But annoying and dull are NOT want one wants in perfume! I need to dig out the original. I cannot remember whether or not I liked it for some reason. This one sounds quite nice, whether it’s a flanker or not. I’ve enjoyed many of Francis Kurkdjian other scents so there certainly is hope for this one. It’s worth trying, I think, especially if you’re already a fan of Kurkdjian. Screechy, I like that. This started well enough for me in its original form, but something in the dry down went badly like brittle must. Just do not want to revisit. Give me an Oriental any day. “Brittle must” is a description I’l have to remember! Love at first sniff is a wonderful–if rare–sensation. Enjoy it! Thank you for this review and I totally agree with you Angela. I purchased the 50ml recently. I have the Intense version and loved the much headier orange blossom and rich vanilla combination. This compared is more translucent and sheer but still maintaining it’s character and some “body”. Right now for those warmer Spring days, it wears beautifully. But just as mentioned, definitely have an atomiser because it is so fleeting. Sometimes it’s nice to have a sheer, light fragrance that you know will dissipate quickly, and I think this one will be good for that. Great review! I’m one who didn’t care for the original , but , loved this . I wondered if that might be the case for some people! I recently purchased the 30ml of this. I did not care for the nuclear radiance of the original but found I burned through 2 samples of this pretty quickly. “Nuclear radiance” is a genius way to describe the original!